Since tungsten filament is made of tungsten, so it owns properties of tungsten—high melting point, high corrosion resistance, high temperature resistance, lowest thermal expansion and inactive to react with other gases. These properties lead tungsten filament to have a better performance in bulbs. There are a number of different tungsten filament mounting styles that have become standard over the years. These are not specified in any national or international standards, but a comprehensive system of nomenclature was introduced by General Electric around 1910. It has been adopted by a majority of other lamp manufacturers and thus exists as a kind of unofficial definition. The system consists of a two-part coding. The first letter identifies the type of filament wire employed (S = Straight Wire, C = Single Coil, CC = Coiled Coil, FC = Flat Coil, R = Ribbon, B = Braided). The second part is a number which indicates the shape of the mounted filament, according to the illustrations shown in the following figure. 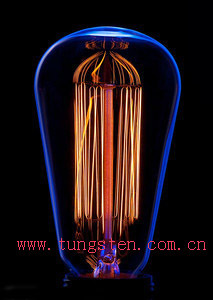 Tungsten filament is used in bulbs, because of tungsten’s properties. The bulb is sealed after removing air from it and filling it with inert gasses under low pressure, thus creating a partial vacuum and a non reactive atmosphere. Tungsten won't react with inert gasses under normal conditions. Thus fusing of the filament is avoided. If air was in it, the tungsten would burn out after reacting with oxygen. 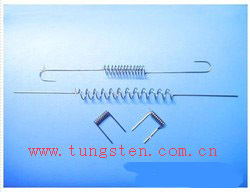 Tungsten filament can be made in lots of shapes, such as coiling, horizontal helix, and vertical helix, and so on. 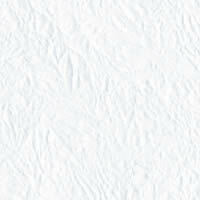 It can be made according to customers’ requirements. For more details about tungsten filament, you can contact by telephone 86 592 5129696, or email to sales@chinatungsten.com sales@chinatungsten.com . Any enquiry or questions will be warmly welcomed.